What sizes do you have and how can I be sure that it fits? Most of our dresses are available in standard size(s) or can be ordered made-to-measure, custom made for your personal measurements. You find detailed information for the available sizes for each product in each product description. We also make custom made dresses after your personal measurements. For these dresses we will need you to provide us with your measurements when placing your order. Can I get some color samples of the fabrics before I make my decision? Of course! You can see our color cards and order your samples in our shop category Color Samples. This includes up to 5 samples of your choice, which we send to your home. Please sepcify your choice of colours as a note in your order. I'm very tall, curvy, petit... Will the standard size fit me? Our dresses are very comfortable and forgiving. You can wear them in the waist or as an empire waist under the chest, which allows you to adjust the length. The standard size has an elastic waistband made to fit all sizes from 32 to 42 (european size). To make sure you will fit in the standard size I advice you to compare your measurements with our recommended measurements below. If not, or if you are not sure about the standard size, you can also order any of my dresses made after your own measurements, to make sure it will fit you perfectly! Length from waist to hem: 116 cm (45,6 in). You can always adjust the length by wearing it in your waist or as an empire waist up under the chest. I find it hard to tell how the design actually looks and how to wrap the dress in different ways, can you explain this to me? Is it difficult? Many of our customers think the same at first, but I promise, it’s not complicated at all! You can visit our YouTube videos to see exactly how it’s done and to get inspiration for different ways to tie your dress. I'm pregnant, do you have dresses that are maternity friendly? Our dresses are very comfortable and, since they are made out of many meters of fabric, they adapt well to the curves of the body. They will highlight your belly without any discomfort. Many of our customers who are pregnant choose to wear the standard size, but you can also have any of the dresses custom made after your own measurements. If you want a dress made-to-measure, please choose the made-to-measure option in the drop down menu and send us the required measurements (specified in the product description). Have in mind the height of the shoes you will be wearing to get the perfect length for your dress. I want to wear a bra under the dress, how can I cover it? Many of our dresses come with matching tube top included (see product description). You can wear the top under the dress to cover your bra or if you want more cover for your back or neckline. This will also add some extra support to your chest. I'm getting married and I want all of my bridesmaids to wear the same dress, but wrapped in different ways. Is there anything specific that I should think of when ordering for this special occasion? Wether you want to order the dresses in a standard size, made to measure or mixed we will be happy to help you get the perfect look for your big day. Let us know if your dresses are ordered for the same occasion so that we can make sure they are all the exact same tone, since the tone might vary slightly when made from different rolls of fabric. What if I don't like the dress, can I return it? If you have ordered a dress made-to-measure, unfortunately not. If it is a standard size dress you are welcome to return it. You find more detailed information the section “Refunds and Exchanges”. How will I know when my dress is ready and has been shipped? We will send you a confirmation by e-mail to let you know that your order has been sent and is on it’s way to you. In the mail we will provide you with a tracking number so that you can see the updates regarding your package (color samples excluded). I need my dress urgently, can I order express shipping? Yes, don’t worry! When completing your order you will get to choose between standard or express shipping, and choose the option that is best for you. I'm a photographer, blogger, journalist... and I would like to use your dresses for one of my projects. We’d love to hear about your idea. Please contact us at social@mimetikbcn.com. I have a shop or am a distributor and I would like to come in contact with you. Great, we’d love to hear from you! 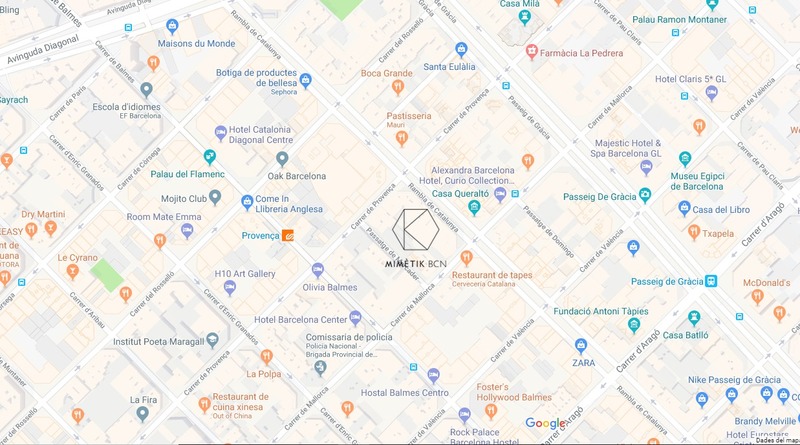 Please contact us at partners@mimetikbcn.com.